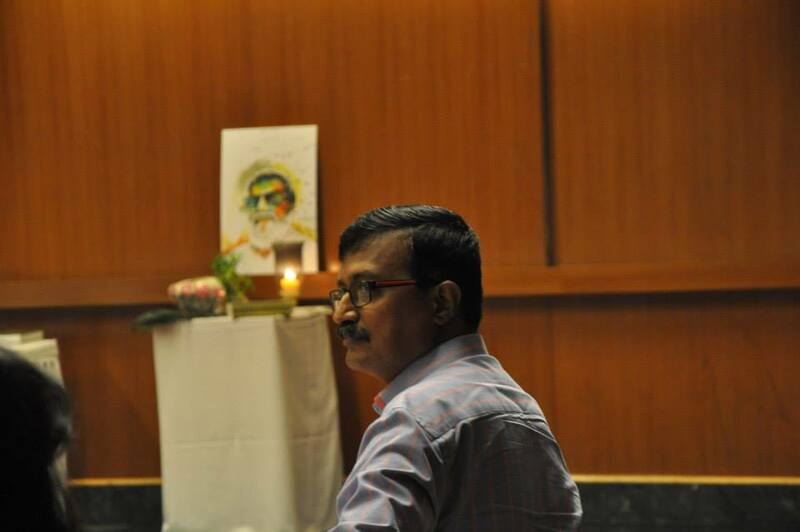 The passing away of our beloved guru, MP Ranjan and the subsequent outpour of grief and memories by the entire design fraternity across the country in Mumbai, Delhi, Bangalore, Dehradun, Hyderabad and Pune, has shaken us all from our stupor. For far too long we have been stuck in our circles, doing our bread-and -butter stuff and were happy to cheer Ranjan doing all those things for the profession at large. Now that he is gone, the onus is on us, the design community, to take his quest forward. Connect with the Peers: We need several formats of connecting for design. Pehcha-Kucha of presentations, Youtube videos, TEDx talks on transformative work done. Or have meetings under a tree. Publish, or Perish: We need to publish: blogs, articles, columns, magazines, wherever possible. On Design. We don’t have Ranjan anymore to do this for us. Educate or Learn : Ranjan was always ready to teach or learn. How about imbibing this? Can we all decide to give back to Design by allocating some time to teach? Showing Compassion: Ranjan was the one of the most compassionate designers I have met. Always giving. A scholarship in his name and memory will help perpetuate it. These are some of the rough ideas. Let’s not wait to perfect these ideas. Let’s begin. Design assignments are not outsourced anymore, it seems. Instead companies with strength and muscle in finance, technology or manufacturing are going all hog and buying off design firms. Small, nimble and creative design firms have been acquired in the past by large corporations, as increasingly, Design is being seen as the new asset for business development. Internationally, this trend has been noticed in the past few years. Google acquired Gecko Design, a mechanical design firm last year. Rumour has it, that Google is getting into new hardware design and therefore decided to buy this firm. When you have a new, break-through product to launch, buy a design firm. China’s Blue Focus, a predominantly PR firm that is also into communication decided to test waters in US’s Silicon valley by acquiring Fuseproject, a design firm that is famous for creating that iconic One Laptop Per Child project. When you want to enter a new market, buy the best design firm. Adaptive Path, a UX design firm of the Silicon Valley, was acquired by finance major, Capital One in October, last year. Soon after, the company launched a mobile wallet app, justifying the need for a design firm buy-off. When you are into expanding your market, buy a design firm. The latest news is that, LUNAR, a UX design firm is being bought off by the consulting company, Mckinsey. The story here seems different. McKinsey, hopes to use Design expertise to solve the problems of their clients. Facebook is known to have bought at least three design firms. Deloitte is investing in Doblin. When you want to solve problems creatively, buy a design firm. If the global trend is to buy design firms, can Indian companies be left behind? Wipro, the formidable technology company decided to acquire Designit, a Danish design firm, this month. The logic for this is clear : to add value to their existing work. When you want to add value, buy a design firm. Design is now the all pervasive, new asset for business. This trend of buying off design firms is not new for India. Tata Motors acquired an Italian design firm, Trilix Srl, five years ago, to enhance their styling and designing capabilities. Kishore Biyani’s Future group, invested in the merger of two design firms of Bangalore, Tessaract Design and Esign, to form Idiom Design, which grew from 2005 to become the largest design firm in India. This has helped the future group invest and rely heavily on Design thinking. When you believe in design thinking, invest in a design firm. There are earlier acquisitions of design firms in India as well. Ray+Keshavan was acquired by WPP in the 90s to help them get into India. Apparatus Media Labs, a UX design firm, merged with Ogilvy & Mather, the advertising giant, to help them become a robust digital design organisation. And one has also been reading about Mahindra group keen on acquiring Pinnanfarina, the Italian design firm, to enhance their design capabilities. All the are examples of building capacities or acquiring capabilities. When you want to enhance capabilities, invest in a design firm. Is this just a fad or is this is a trend to map? Whether it is Facebook or Future group, Design’s contribution in developing a business is becoming more obvious than before. It is becoming the trophy wife, everyone is flaunting. From a peripheral, add-on, Design is fast becoming an asset for organisations of any size or stature. Suddenly, the adage ” Good design means good business”, takes on a whole new meaning. It was a sign of the times. It was an event on Design, hosted by the hugely popular business newspaper Economic Times in India. In that just concluded ET Design Summit 2015, in Mumbai, Mr Navroze Godrej, was quoted as saying ‘ Design should be elevated to the Boardroom level, if business is to make design really work at senior level.’ Noble thought that. Navroze is singularly qualified to say this. He is the new generation Godrej in the Board of Godrej & Boyce, who is also a qualified industrial designer from IIT Institute of Design, Chicago. He is also credited with introducing disruptive innovation in the company by setting up an Innovation centre at Godrej. As a fellow designer, I am happy that he is using his position of power to create Design awareness. Navroze is in the board, because he is a Godrej and an heir apparent to the group of companies. He can also be the poster boy for the Boardroom designer, a new spin-off to the design professional in India. Another designer who is using her design skills to design strategy instead of stuff is Ashni Biyani, director in the Future Group board, that is led by her famous father, Kishore Biyani. Ashni has even better credentials. After she graduated in Textiles Design from Srishti School of Art & Design, Bangalore, she did design courses in Parsons and then a management qualification from Stanford, only to come back and join the Future group, the big dad of retailing in India. She is being credited with single-handedly bringing design-led thinking to the group that owns brands like Big Bazaar, Nilgiris and Central. Ashni is known to influence the entire group into Design thinking and helps strategising the business. 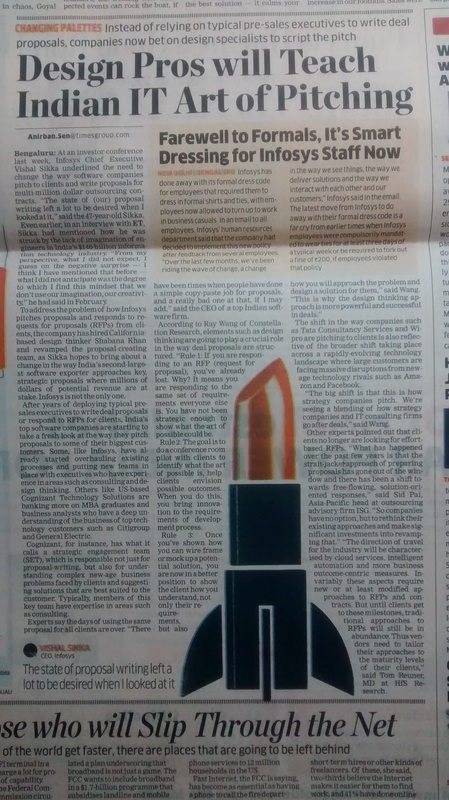 Suddenly, Design is being looked upon as the Holy Grail that will bring succour to the businesses in India. Vishal Sikka, CEO of Infosys and an ex-SAP man, seems to have ordained all the 5000-plus staff in Infosys to go through a programme on Design Thinking. That his ex-company SAP’s Hasso Plattner also supports the d* school in Stanford, shows where Mr Sikka’s influence comes from. He claims that, “..design thinking, a creative and systematic approach to problem-solving by placing the user at the centre of the experience, has helped the business win five large deals.” Sikka should be made the patron saint of design thinking. In what can be termed as an industry-first, he has roped in design professionals to help his sales team to write and design sales pitches. This augurs very well for the Design profession. Designers can now find new avenues in businesses, because of their singularly important skill on design thinking. Godrej and Biyani have found their way into the board room, more because they have the chosen surnames and not because that they are designers. But, seemingly, they are leveraging their position of power to spread the cause of Design thinking. When they move on to higher positions, they would be keen to use professional designers, who may not be family. Long time ago, in 2011, Time magazine had waxed eloquent about the Indian CEO. I had written a post on this, pitching for Designers as CEOs, which was received very well. “What I find interesting is the attributes that Indians have that is apparently tailor-made for operating in the chaotic world today: Multi culturalism, ability to work under complex constraints, working with meagre or depleting resources and speaking the global business language : English. I am happy to see that a beginning has been made. Designers entering the board room, will definitely make an impact in businesses and the sooner the businesses learn that, the better. Designers are going to give their MBA counter-parts in businesses something to think about. 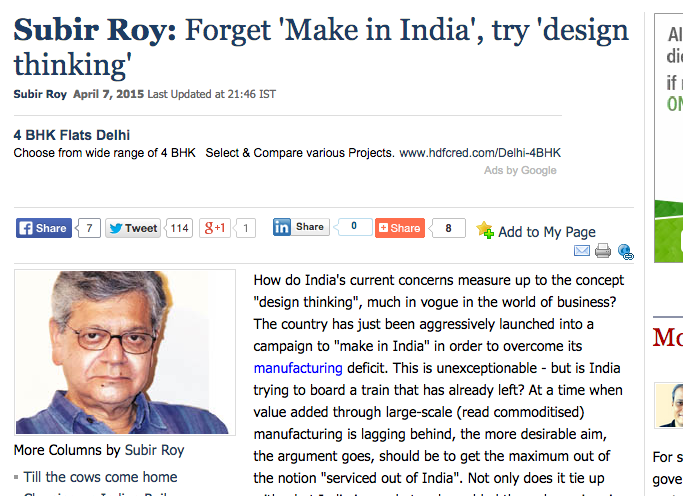 The Business Standard’s columnist, Subir Roy, today wrote an incisive column, asking the business folks and the PM to ‘ forget – Make in India and try Design Thinking’. Will the PM and the business tycoons listen to the newest design evangelist, please? I was involved in two totally unconnected events this week : One was judging a 3D student design challenge for Autodesk and the other, I was an invitee to a presentation and panel discussion by Pearl Academy. Both were, coincidentally on the future of design. The Autodesk 3D Student Design Challenge , with the tagline: The Future is Now, was a competition on designing a future-ready bicycle for public use. I was invited to judge the North and Eastern regional rounds. Participants were predominantly from prominent engineering colleges. The concepts scored high on material, fit, strength, manufacturability and modelling. But it ranked low in usability, convenience, sustainability, service design models and safety. All of which are the core strengths of a designer. Engineers focus on thing-to-thing relationships in product development, so much so, that they forget the thing-to-people relationship. What was missing was imaginative ideas that questioned the status quo. This is not a comment on the organiser or the students. It shows how design is taught in engineering colleges in India. Engineers in India need a crash course on empathy. A small workshop in creativity. And work on a project using design thinking. That’s the way to go into the future. 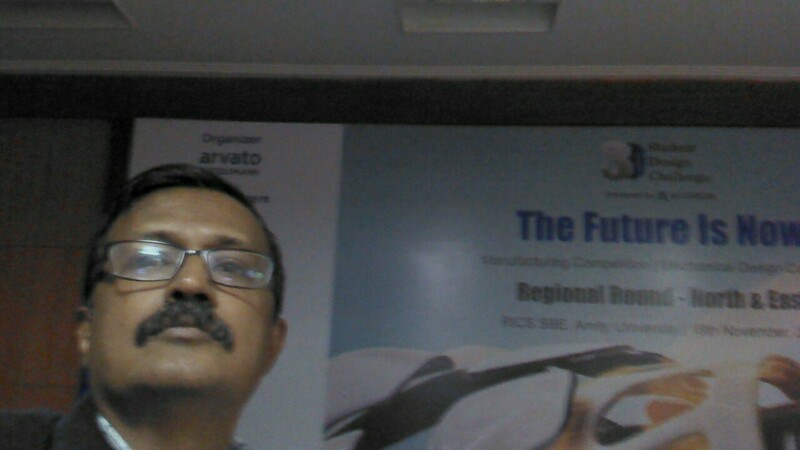 Design needs to be urgently plugged into all programmes in Engineering and Technology courses in the future. The future will be unforgiving if they ignore it. 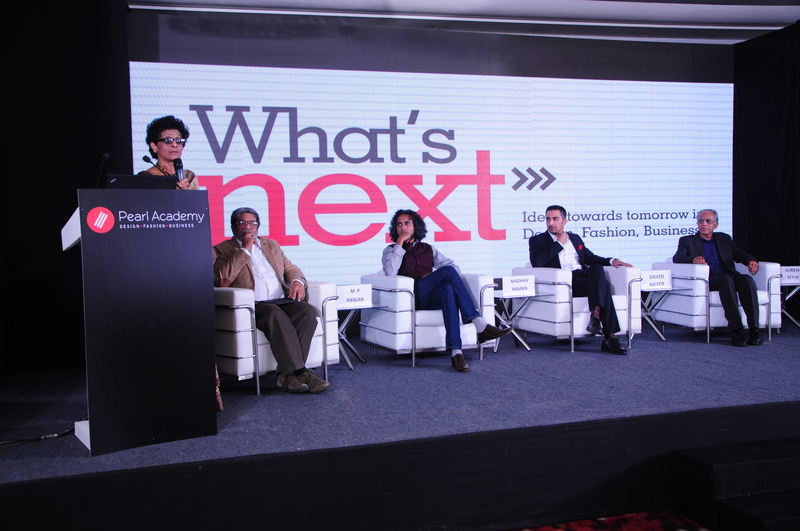 The second event was Pearl Academy’s presentation on “What’s Next”, was an enjoyable evening where academics and businesses presented and discussed the future of design. A fine initiative by Pearl Academy, that is poised for growth and expansion in the field of Design education. Four fine presentations by Prof M P Ranjan, Design thinker and academic, Suresh Sethi of Whirlpool, David Hyer of The Gap and Madhav Raman, Urban architect, all stalwarts in their own domains, set the tone for discussion. This was followed by a presentation by the CEO Sharad Mehra’s dream and vision to build the academy and venture it into newer areas in design, including online programmes. What was most interesting is that Pearl is evolving from a commercial, fashion institute catering to the elite to a large academy with new schools, catering to a larger audience with different mindsets, requirements and priorities. Their tectonic shift from showcasing fluff and fashion in fashion shows to publishing and releasing a book of socially-relevant, inclusive, imaginative projects for the marginalized and the disabled is significant. They are realizing and responding to the value Design can bring to society at large and not just big businesses. Design itself is also evolving from being a mere form-giving activity. It is morphing into service design, strategy design and business design making this a core subject that plugs into all domains. I believe that the future of design is all pervading. It has to cater to all sectors of the economy. The divisions and specializations are blurring. The world is shrinking and one can no more afford to work in silos. School and professional education has to be enriched with design thinking. Designers will be expected to take on leadership roles and have to become more disruptive, responsible and inclusive. They should learn to cultivate empathy to cater to the last individual. Sustainability will become the mantra for the future of design. Imagination will become paramount and creativity will be the key to solving world’s problems. To remain significant in the future, educational institutions will have to focus on creating this talent. Find new ways of delivery. Go online. Make students collaborate. Be geography-agnostic. Or else, be prepared to become history.